This isn’t a true book review, because I contributed to the book. I like Westerns. I like the action, the terse but poetic dialog, and I love the sublime settings of the Southwest. My affinity is also conditioned by the fact that I grew up in California in the mid-20th Century. This was a time when the Western was the most popular form of entertainment in the United States. In 1959 alone, there were 26 Western TV shows on the air during prime time! The typical Western story is fast moving. As a viewer or reader, you are pulled quickly into the dramatic action. The action begins in the first few seconds on screen, the first few lines on the page. I like this genre, and had a great time working on the project. So instead of a review, this will be a short essay about what I like about the project. I think the two contributing editors, both friends of mine, have done a wonderful job. You have enough time to read one Western each week for a year. Which ones would you choose? Scott Harris actually asked himself this question when he embarked on a Western reading plan a few years ago. He discussed it with his friend Paul Bishop and somewhat later, 52 Weeks • 52 Western Novels is the answer. For their purposes, they would include Westerns set west of the Mississippi River and containing no more than 250 pages. This isn’t as narrow as it might sound. These selection criteria do disallow important books that historians would want to include, such as James Fenimore Cooper’s Last of the Mohicans and his other Leatherstocking tales. These were essential Western precursors, written in the early 19th century. But the books are over 400 pages long. They are also set too far east, being frontier stories taking place around the Appalachian Mountains, not too far from the Eastern Seaboard. My grandmother would have wanted to include Laura Ingalls Wilders’ wonderful Little House on the Prairie books. But they are also a little too long. Some of them are set too far East, and they aren’t so much Westerns as settler or pastoral stories. But most Western fans would approve of Scott and Paul’s selection principle, for it allows for the books that are dearest to the Western fan’s heart…. I’ll return to this textual organization below, because it contributes to the extremely readable format of the book. But for now, I want to discuss the book’s content. The 52 novels cover a wide range. The publication dates span over one hundred years, from 1902 to 2015. Many of the books became famous because of the movies they inspired, such as The Big Country, Charro!, Hondo, The Outlaw Josey Wales, Shane, The Searchers, True Grit, The Virginian, Zorro. But not all the books are this famous. Also included are Westerns considered to be “literary” (The Day the Cowboys Quit), a children’s book (Old Yeller), “Picadilly Westerns” (Westerns by English writers, such as Edge), and some other books that consider issues of social justice. For example, it’s true that the Western genre is usually a white, male arena, with all its biases and blind spots. 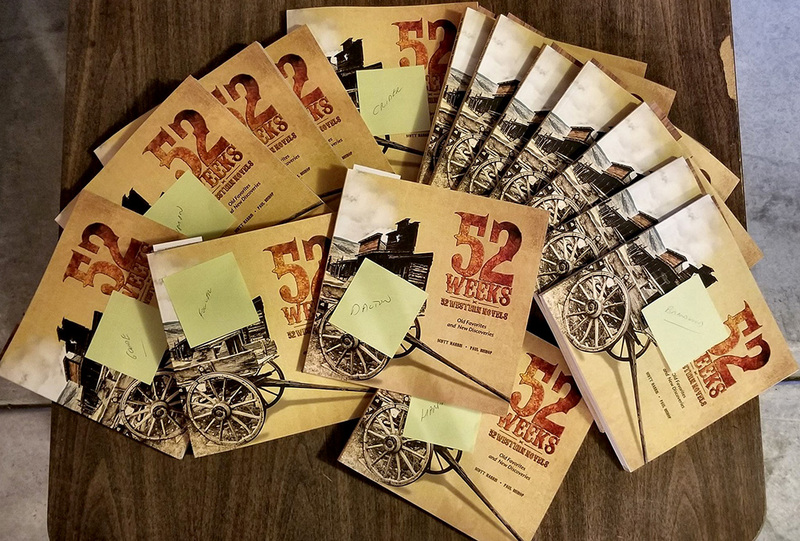 But 52 Westerns includes some welcome exceptions, such as books with: a female protagonist and female author (Double Crossing by Meg Mims), a black protagonist (The Last Notch), activism against the racist treatment of Mexican Indios (Zorro), protection for women abused by Mormons (Riders of the Purple Sage), protection against human trafficking (Broken Trail). There are also several novels in which animals are honored and valued characters. The selections also include books that have gained a devoted following among long-time Western readers and writers. These tend to be the better-written, more action-packed stories published in paperback form, especially from the 1950’s through the turn of the century. For example, .44 by H.A. De Rosso, Badman by Clair Huffaker, The Name’s Buchanan by Jonas Ward, The Tall Stranger by Louis L’Amour, The Edge series and the Fargo series (not Wells Fargo). 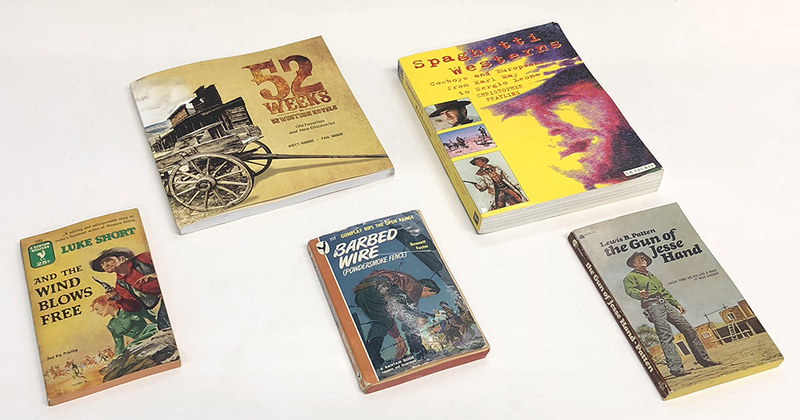 There are even three non-fiction books among the 52: Wordslingers (collections of authors’ insights on their craft), Six-Gun in Cheek (hilarious book about the worst in Western fiction), and Shooting Scripts (about the journey from pulp Western to film). The Western has always been a very self-conscious genre, aware of its own metaphors and mythologies. 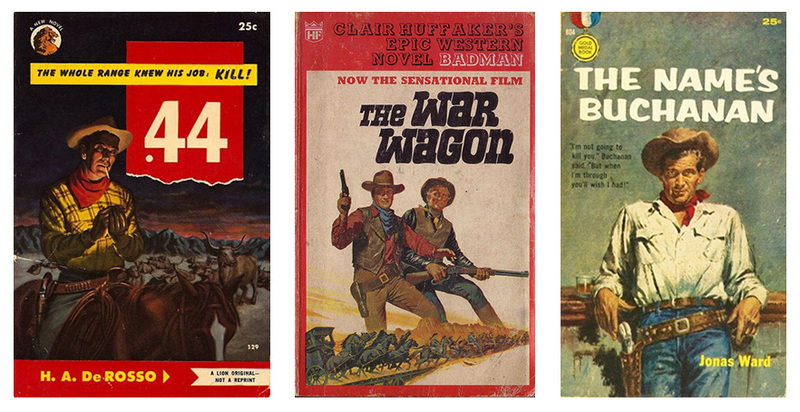 So books about Westerns form a natural part of the Western genre. In my opinion, the true genius of this book lies in the typesetting and layout. The 600-word limit guarantees that each essay can be contained on a 2-page spread without any spillover or awkward page breaks. The spreads partake of a superb master design that’s very inviting to the eye. Each spread is richly decorated with images, perhaps a cover photo, a pulp-magazine cover, a movie poster or an author photo. As I mentioned above, the essays are organized into sub-headings (Book Facts, Author Facts, etc.). Each of these sub-sections has its own word-limits set by the editors. This subtle detail creates a pleasing consistency from spread to spread. The same elements end up in same places. This consistency makes the book engaging and easy to read. 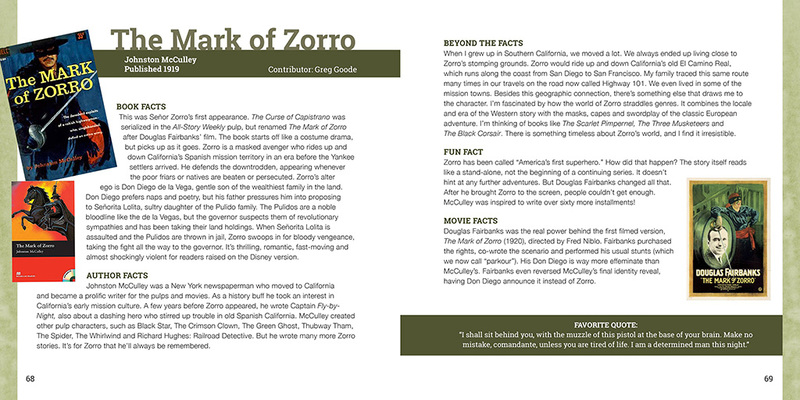 At only 8 ½” square paperbound, the book is smaller and lighter than the average coffee-table book. The binding is sturdy. It doesn’t crack or lose pages the way some larger books do. It’s easy to hold, and lays flat pretty well. The “52/52” format is a wonderful publishing palette. Indeed, there are two more projects in the works, one for Western movies, and one for Western TV shows. I’m excited to be included in these projects. And I know that editors are fans of several other genres as well, so there’s much more to come!